There are so many different salads and ways to eat them, but when I think of putting a twist on salads I wonder what is more twisted than a salad you eat with your hands? No, I am not suggesting you dig in to that caesar with your fingers, I am talking about salad sandwiches! Salad is delicious, but when you have the right salad recipe sandwiched in a delicious roll you twist it to new level. Chicken salad and egg salad are classics for sandwiches, but there are so many other amazing options. Try these recipes for some new and exciting salad sandwiches. Combine salami, cheese, celery, and olives in large bowl; toss to blend. Mix mayonnaise and roasted peppers in small bowl to blend; season dressing to taste with salt and pepper. Cut bread crosswise into 4 equal pieces. Cut each piece horizontally in half. Scoop out some soft center from each bread piece, leaving 1/2-inch-thick shell. Spread dressing in hollow of each bread piece. Divide salad mixture among bottom bread pieces. Top salad with radicchio; press bread tops over. (Can be prepared 4 hours ahead. Wrap sandwiches tightly in foil and chill.) Serves 4. Place ham, mayonnaise, mustard, Worcestershire, and Tabasco into bowl of food processor. Pulse until it is all finely chopped, but make sure it doesn’t turn into a paste, about six to eight 1-second pulses. 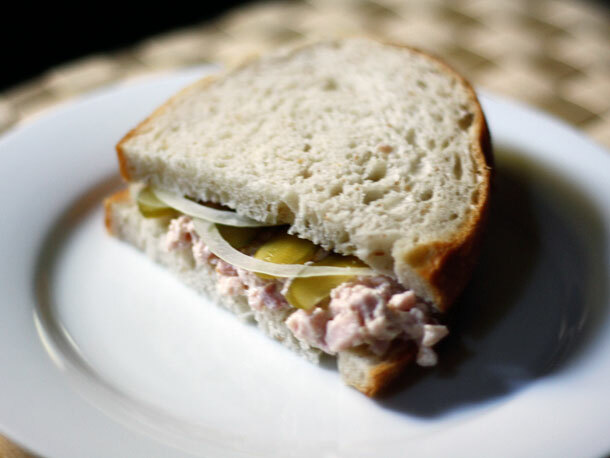 Divide ham mixture evenly on four slices bread and top with pickles and onions. Top with remaining four slices bread and serve immediately. Serves 4. Combine all ingredients except bread or rolls and mix well. Spread on bread or rolls and serve. Serves 4. In a small bowl, add the tuna and flake with a fork. Add the celery, lemon juice and mayonnaise and stir well. To serve, place 1 lettuce leaf on a slice of bread. Top with 1/4 of the tuna mixture and another slice of bread. Repeat to make the other sandwiches. Serve immediately. 1. Mash avocado in small bowl; stir in green onion and lemon juice. Season to taste with salt and black pepper. Spread avocado mixture on cut sides of roll tops. Layer roll bottoms with remaining ingredients except olive oil; close sandwiches with roll tops. Brush outsides of sandwiches lightly with olive oil. 2. Place large nonstick skillet over medium heat until hot. Add sandwiches. Cook sandwiches 4 to 5 minutes per side or until cheese melts and sandwiches are golden brown.